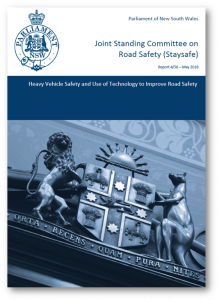 Earlier this year we made our submission to the NSW Inquiry into heavy vehicle safety and use of technology to improve road safety. The Staysafe Committee of the NSW Parliament has now tabled its report and we’re pleased that our recommendations have been included for future consideration. The Amy Gillett Foundation focused in its submission on the interaction between heavy vehicles and vulnerable road users, and the technologies being developed to manage this interaction more safely. The Foundation recommended that all new technologies be reviewed by vulnerable road user experts before their introduction. Vehicle design – The need for further attention to vehicle design was also raised by the Amy Gillett Foundation following a review of coronial recommendations relating to fatality crashes involving a cyclist and a heavy vehicle. This study, undertaken in partnership with Monash University academics and Toll Group, found that the most frequently made vehicle-related recommendation focussed on visibility and maximising the driver’s capacity to see the road user outside the cabin. In vehicle technologies – lane departure warnings (LDW) – The Amy Gillett Foundation raised concerns about an unintended consequence of the technology where it automatically centered the vehicle in the lane in response to a driver moving out of the lane to avoid a cyclist. The Foundation proposed LDW be coupled with cameras to ensure vehicles maintain safe separations. It has established a partnership with Toll Group aimed at raising industry awareness of roads safety risks for vulnerable road users. 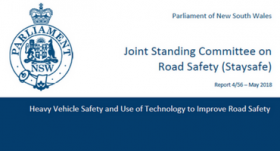 The Foundation urged that all new heavy vehicle safety technologies be evaluated from the point of view of the vulnerable road user with regard to unintended consequences. In vehicle technologies – object detection – Transurban and the Amy Gillett Foundation both noted the significance of technologies such as 360 degree vision, blind spot detection and turning warnings to alert drivers to their surroundings and other road users, particularly vulnerable road users connected and automated vehicle (CAV). Connected and automated vehicle (CAV) – The Amy Gillett Foundation also urged further research and development of CAV technology with a view to delivering greater protection to vulnerable road users (cyclists and pedestrians) interacting with heavy vehicles. In its submission the Foundation pointed out the historical focus in the development of CAV technologies on connectedness between vehicles and infrastructure. It argued for a new focus on connecting vehicles to people through smart phone applications. The Foundation advocated for NSW Government support for this research and that the perspective of vulnerable road users be a feature of continuing research and development of any CAV technologies. Vulnerable road users – The Amy Gillett Foundation advised the Committee of its research relationship with Monash University and Toll Logistics. As part of this relationship, the partners examined cycling fatalities and subsequent coronial recommendations. With regard to heavy vehicle safety technology, the Foundation found coronial recommendations focused on visibility and maximising a driver’s capacity to see road users outside the cabin. The Foundation proposed that all new heavy vehicle technologies be reviewed by vulnerable road user experts to reduce safety risks to cyclists and pedestrians.